A challenging event tackling the Lake District's four 3000ft peaks. The Lake District has four mountains which are over 3000 foot in height and these can be combined into a challenging walking event generally known as the Lake District 3000 Footers. This event can be done over one or two days in either 1 x 16 hour or 2 x 8 hour days, depending on the individual groups ability and their previous mountain walking experience. We can also offer alternative routing options based on where the group are staying in the Lake District. However, all of these peaks can be easily accessed from Keswick so this is often a good starting point. 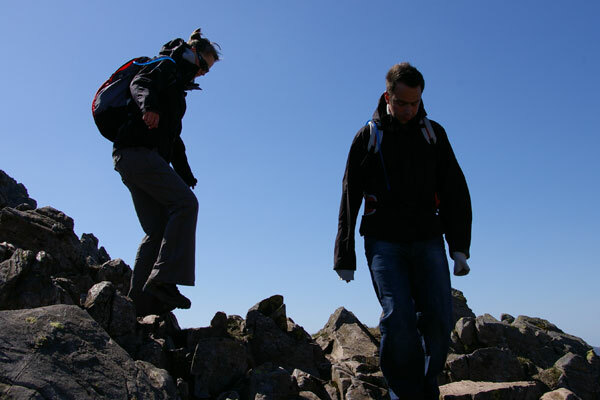 From Keswick, Scafell Pike and Scafell are summitted at the same time via the Corridor Route, Esk Hause or Grains Gill. Thereafter, Helvellyn is usually tackled from Swirls Car Park at Thirlmere, and Skiddaw from either Millbeck or Latrigg. As the ascent of Skiddaw is probably easier than Helvellyn and slightly closer to Keswick, it is often the preferred option as the final peak. The Lake District is the perfect short break destination for those who enjoy the outdoors and offers a wide variety of things to do throughout the year. It is an ideal location for challenge events and may be combined with a group trip to the Lakes for a weekend or short break. Arrive in the Lake District and spend a night at your Keswick accommodation. Have an early breakfast at your accommodation and then a minibus will pick you up and take you to meet your guide at the start point of the first walk. Upon completion of the first day's trekking then you will be taken back to your accommodation in Keswick. I am pleased to say that we were delighted with the organization of the '3,000ft Four Peaks Challenge' weekend which you arranged for us in the Lake District last year. The routes of the climbs you planned out for us, the guides, accommodation and the general back-up were excellent, and we will certainly be contacting you if we decide to do something similar again. We would not hesitate in recommending you to anyone proposing to undertake a similar challenge or mountain-based corporate event. I wish you continuing success in your venture. I would have no hesitation in recommending you and your company for mountain outdoor activities of all types. Our experiences with you last year in the 3,000ft Challenge in the Lake District were memorable for all the team and the organization was perfect. I would have no hesitation in using your company again when we decide to organize our next event. All the best in your future ventures.